Size: 500 grams each. One snapper will yield about 230 grams of meat. 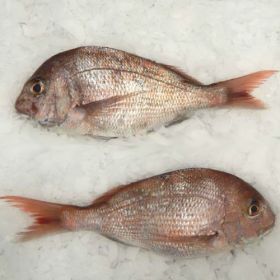 Preparation: Whole Snapper is usually cooked before consumption. Other Names: Australasian snapper, cockney, cockney bream, old man snapper, pink snapper, pinkies, red bream, schnapper, squire.